True blue-green French heirloom that can overwinter in Vermont. It's hard to exaggerate the stalwart hardiness of this 19th century French heirloom. Indifferent to cold, the plants will happily overwinter in Vermont. True blue-green, the very large 15-20" tall stalks turn still bluer as the weather gets colder. It's sweet, mild and flavorful. Sow in early to late spring for a fall crop. In the Deep South, Gulf and Pacific Coast areas, sow from fall to early spring. Choose a location with loose, well-drained soil in full sun where you did not plant members of the onion family the previous year. Sow seeds ¼ inch deep in rows 18 inches apart. 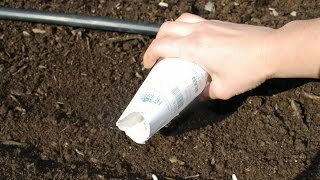 When the plants are about the size of a pencil, wrap the base of the stalks with paper or mound up the soil to blanch them. Harvest leeks when the bases of the stalks reach ¾-2 inches in diameter, about 90 days after sowing. Sever the roots under the stalks and twist the stalks back and forth to loosen them and ease them out of the ground. Cut off remaining roots and all but 2 inches of the leaves. Harvest as many leeks as you will use and leave the rest to harvest later in winter. Mulch leeks heavily in cold winters. Leeks may be frozen after blanching. Pink Root Rot: A fungus that attacks roots causing them to turn a light pink, then red and eventually purple-brown and causing them to shrivel. Infected plants show signs of nutrient deficiencies and drought because the roots cannot take up water and nutrients. Plants are stunted. The disease lives in the soil for several years and thrives in warm temperatures. Burpee Recommends: Plant as early as possible so the bulk of the plant growth will be in cooler temperatures. Rotate crops and plant resistant varieties. Rust: A number of fungus diseases that cause rust colored spots on foliage, stalks and husks. Burpee Recommends: Plant early as these diseases tend to be worse later in the season. Plant resistant varieties. Practice crop rotation. Remove infected plants.